I have debated about doing a post like this, because there are dozens of gift guides every Christmas, but I have been wanting to do one for years, so I figured, why not? So here it is. 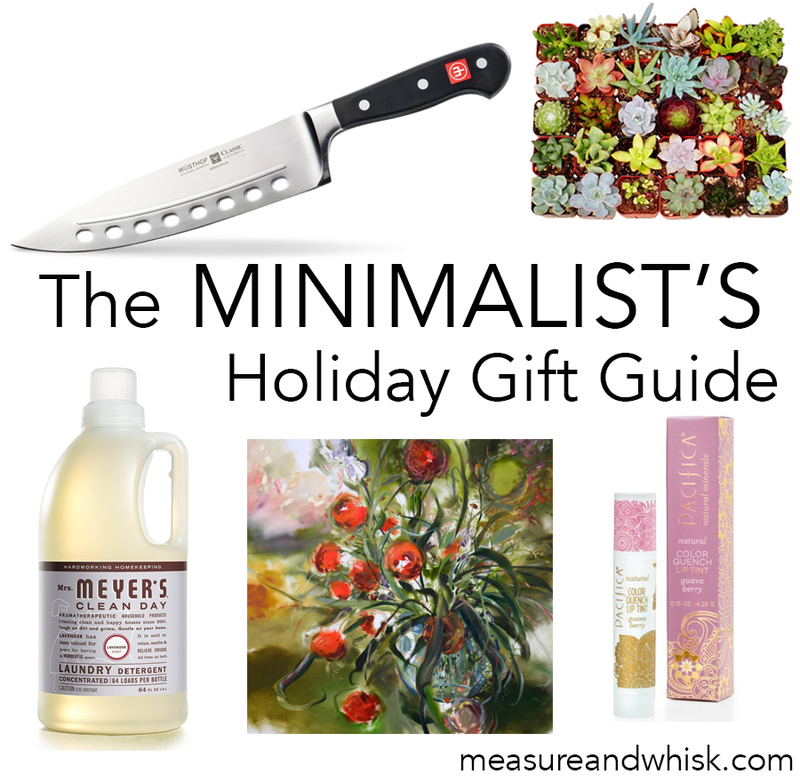 Being a minimalist presents certain challenges around the holidays. You might receive a ton of gifts from family and friends, you might be married to someone who loves giving and receiving gifts. You might love getting/giving gifts yourself, so what should you do during the Holidays? We live in a society that loves stuff and wants to give it all the time, but most especially during the Holiday season (at least marketers would have you believe that you should give stuff all the time), so here is my take on it. Give something non-tangible, something meaningful, or something useful. 1. A Houseplant - It cleans the air and looks pretty. Bonus points if it is an edible plant like a rosemary or basil plant ! 2. A meaningful piece of art - One of our friends is an amazing artist, and he just gave us an incredible original piece that he did. It hasn't arrived yet (it is coming from Germany), but it will be a treasured item to add to our small collection of art. We already have a gorgeous painting that Merrick did for us one year, and a number of pieces collected from our travels (a metro map from Lyon, fun touristy posters from Chamonix, and a gorgeous photo that Adam took in Denmark this summer year that we got printed). Even if you just print a beautiful photo from a favorite vacation, or a print from a favorite artist or calligrapher, that can be a wonderfully meaningful, and a true gift from the heart. 3. A item for the kitchen. Everyone has to eat, right? Grab something beautiful and useful for the kitchen. I have a few favorite items to recommend this year. A really nice knife. So many people own terrible knives these days. Cheap, dull, ugly, etc. We have gotten a number of friends sharp kitchen knives for their birthdays over the last few years, and they have been a great gift! We just got two Wusthof Knives earlier this month, and they have been life-changing (we have the Vegetable Knife and the Bread Knife )! It is basically a transcendent experience every time I chop vegetables and bread now. I can't recommend them highly enough! High quality does make a difference! We also got rid of all of our tupperware when we moved last summer, and I have been embracing life with jars. A few Weck Jars , some Glass Canister Jars , or the like could be a very fun and useful gift, especially if you filled them with a freezer jam, a cake mix or something they can easily use up. 4. Tickets to a show/class or event - This is a harder gift, because you have to do research, and you definitely want to make sure they can actually attend the event you are buying tickets to, but giving a memory is such a special gift. I think it is worth it. Some of my favorite gifts have been memories. 5. A bottle of Lemi Shine or Mrs. Meyer's Laundry Detergent - Janssen mentioned a few days ago that most people don't want another plate of cookies around the holidays, and I have to agree with them! Give something useful and wonderful! They will remember that you gave them laundry soap for 64 loads, which is probably longer than they would remember some cookies. As a side note, I have used the Mrs Meyer's Lavender Laundry Detergent for about a year, and it brings so much joy to laundry. They sent it to me as part of my Mrs. Meyer's Semi-finalist prize, and it has been my favorite of all the items they sent. 6. A natural skincare product that they might be afraid to try out on their own. I have been wanting to try out natural skin-care for several years, but didn't know where to start. I finally had to dive in (I got spurred on by a natural skincare post I am working on), and I have been trying out a bunch of new skincare products. A few that I am loving include: SheaMoisture Argan Lotion (this is really the most amazing lotion!) , Pacifica Lip Tint , Acura Face Wash and if you want to give them a sampler of a bunch of natural products, this sample size pack from Credo Beauty has some great stuff in it . I have about 15 others that I am and will be testing out, but those are my picks for now. More to come on that in a few weeks. 7. Gift a night out, or a babysitting swap. My husband is currently in school, and we are trying very hard to be careful with our money, so we rarely spend money on a babysitter. This fall, one of my friends and I have been doing a monthly swap, and it has been so awesome. If someone gave this gift to me, I would be ecstatic! 8. Give of yourself. At Fox's baby shower, one of my dear friends gifted us a newborn photo shoot. She is a remarkable photographer, and took the most beautiful photos of Fox when he was two weeks old. I cherish those photos and the time she took to take and edit them. Maybe you are a great at photography, have a decorators eye, or are a talented quilter. Think outside the box and consider giving a gift of yourself. Are you trying to have a more minimalist Christmas? What are you giving your loved ones? So I LOVE your detergent recipe, it's all I ever use since your post a few years ago. When you finish up with the Mrs. Meyer's, will you continue to buy it or go back to using your recipe? Thanks, Varissa! I am thrilled you like it! I have used it with great results, and probably will go back after I finish up with the Mrs. Meyers (I actually have another box of detergent to use up that was a gift, also). I do plan on going back to a scented soap, though. I was using the unscented one when Fox was a baby, and I really missed having nice smelling laundry. The Mrs. Meyer's smells great and I have loved that.